Richard Baudry, DPT, OCS is a well respected Doctor of Physical Therapy who has practiced in the New Orleans’ region since 1993. A graduate of Louisiana State University, Baudry earned his Bachelor of Science in Psychology in 1990 and a Bachelor of Science in Physical Therapy from LSU Health Science Center in 1993. In 2004, he earned his Doctor of Physical Therapy from Ola Grimsby Institute. Baudry has specialized in the management and rehabilitation of orthopedic and sport related injuries and has over 22 years of clinical and managerial experience in the field of physical therapy, fitness and sports training. He served as Partner in Crescent City Physical Therapy and was CEO/Owner of Wellness Physical Therapy. Most recently, he founded and serves as CEO of both Baudry Therapy Center (2008) and BRIO (2012). 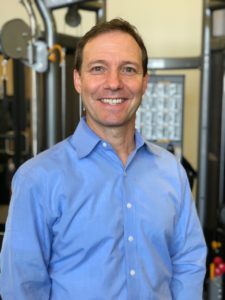 Baudry has been recognized as an Orthopedic Certified Specialist, an elite credential from the American Physical Therapy Association signifying in-depth knowledge and masterful skill in orthopedic physical therapy. He has extensive training in trigger point dry needling, serves as a Titleist certified (TPI) Golf Fitness Instructor, a Functional Movement Screen specialist, and a lifetime certified ASTYM provider. He is an active member of the American Physical Therapy Association, the Louisiana Physical Therapy Association and Vistage New Orleans. Throughout his distinguished career, Baudry remains passionate and dedicated to helping clients unlock their potential and takes pride in offering the best of care to every patient. Baudry is a New Orleans native who resides in Metairie with his wife and three children. He is an avid athlete who participates competitively in golf, tennis and running events.